One particularly interesting piece is the Concerto for Horn by Ralph Hermann. According to the website http://www.horn-and-band.info/, the work was “The first full concerto originally written for solo horn with concert band,” and “was a collaborative project with James Chambers and the American School Band Directors’ Association.” Looking at the LP notes, there is some additional information on the piece itself and the premiere performance. This concerto was written for Mr. 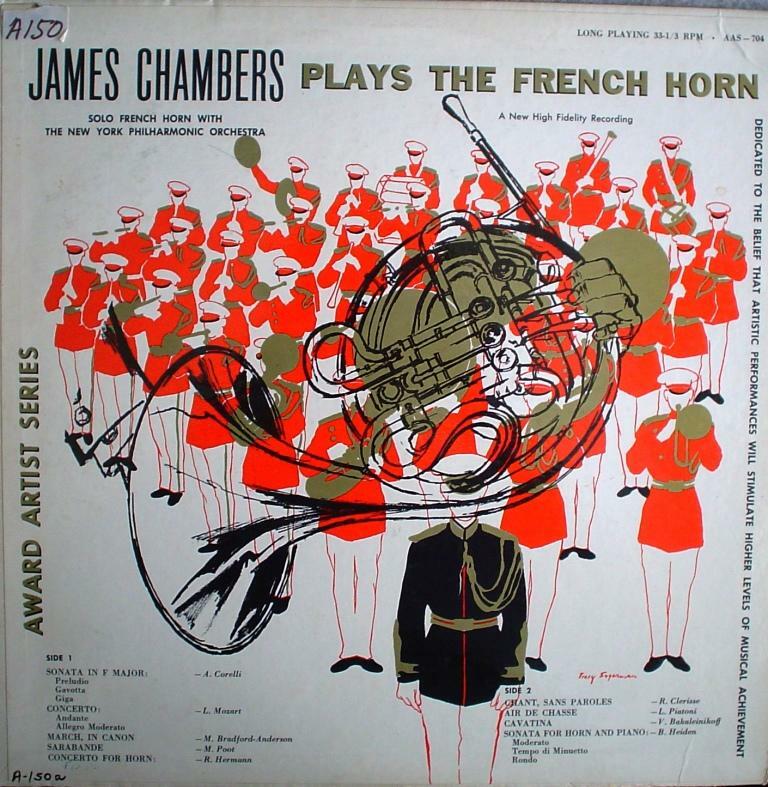 Chambers by the contemporary American composer, Ralph Hermann, and was given its first public performance at the annual meeting of the American Bandmasters Association on March 9th, 1957 in Pittsburgh, with the accompaniment being furnished by the United States Air Force Band. The Finale, which is recorded here, employs a two octave range, has an extended cadenza and calls for a high level display of French horn virtuosity. On this recording all of the accompaniment is competently provided by a pianist, who is unfortunately not listed (from what I can see) anywhere on the record. The horn playing is, as one would expect, spectacular, especially for a recording made in the age before digital splicing. Chambers has a huge, liquid sound, and his tone quality and overall approach are still emulated by many players. The concerto itself is a nice piece, and looks very playable. If you’re looking for something by an American composer to include on a recital or for a solo performance with band, consider the Concerto for Horn by Ralph Hermann. Unfortunately this recording is no longer in print, and the piece itself may be out of print too, although several university libraries probably have them both. Here are two short clips from the Finale – the solo cadenza from the beginning of the movement, followed by the end of the movement, including a nice ossia high c# as the penultimate note. I have played the last movement of the Hermann several times with band. Especially in a summer parks concert setting it is a crowd pleaser. Great post. Thanks John! Hope your semester is getting off to a good start. I played the Finale in my senior year in high school in 1960 and earned a 4 yr scholarship to the University of Montana. Unfortunately, I wasn’t able to go to college at the time. How do I find a cd of this album? I don’t think it has been released on CD. Our university music library owns a copy. You may be able to find a used LP on Amazon or another similar retailer. If you have a turntable and some basic recording equipment, you can make a fairly good LP to CD transfer. That’s too bad as I don’t have a phonograph(does anyone?). I found a couple of people on YouTube playing it but they didn’t play it very well. To your knowledge is there any other recording of Hermann’s Concerto for Horn? Not to my knowledge, but I will look! Just wanted to let you know I’ve started work back up again on my website. I’m adding composition-specific information, so more is being posted about Hermann’s concerto. Take a look as it develops! That’s great news Brent! Looking forward to watching the site develop. I hope the recital tour went well. Does anybody happen to know where I could get a copy of this piece? Thanks for reading. Based on the information found on Brent Shires’ website, the Hermann Concerto is out of print. Perhaps a local university library has it? Thanks for the help! Looks like I’ll be making some phone calls. Do you have this entire album transferred to digital, and if so are you willing to share it for academic reasons? I actually don’t own this LP – it belongs to my university – so I am uneasy with copying and distributing, even for academic reasons. Perhaps a local university library near you has it? You might also see if you can track down a used copy on Ebay or a similar site.